I find it terribly difficult to write reviews for this series. Because I read the books and they impress me so much that I can't write the review immediately. And then a week goes by and I feel it's been too long to adequately convey how much I liked the book. With 2 Hugos already down for book 1 and 2 this is an absolutely worthy conclusion to the trilogy. It introduces some beautiful background to the world that so far had been missing - I heard the word "solar punk" mentioned on twitter somewhere in answer to the question what Syl Anagist looks like. All energy is the same, through its different states and names. Movement creates heat which is also light that waves like sound which tightens or loosens the atomic bonds of crystal as they hum with strong and weak forces. In mirroring resonance with all of this is magic, the radiant emission of life and death. Sadly, this is not even the best quote to show the beauty and depth to which the author must have studied geology, especially when describing the stone eaters the voice becomes so filled with stone metaphors and idioms ... if not for the great story one has to read the book for the language. But there are none so frightened, or so strange in their fear, as conquerors. They conjure phantoms endlessly, terrified that their victims will someday do back what was done to them – even if, in truth, their victims couldn’t care less about such pettiness and have moved on. Conquerors live in dread of the day when they are shown to be, not superior, but simply lucky. “I – That question doesn’t make sense.” But now I’m just being stubborn. I understand her point. I’m not what they made me; I’m something different. I am powerful in ways they did not expect. They made me but they do not control me, not fully. This is why I have emotions though they tried to take them away. But for a society built on exploitation, there is no greater threat than having no one left to oppress. Yes, there's politics. I think it's subtle enough to add to the story rather than disrupt the flow. Politics is not the primary objective of this trilogy it's just a side dish that fits well. My favorite quote must be this last one though and that's not politics just ... an insight. “I think,” Hoa says slowly, “that if you love someone, you don’t get to choose how they love you back.” So many layers in the strata of that statement. And that's it. If you haven't read the trilogy, read it, now. Sign into Goodreads to see if any of your friends have read The Stone Sky. 25.0% "Slow reading, but also enjoying the words ... so beautifully crafted. 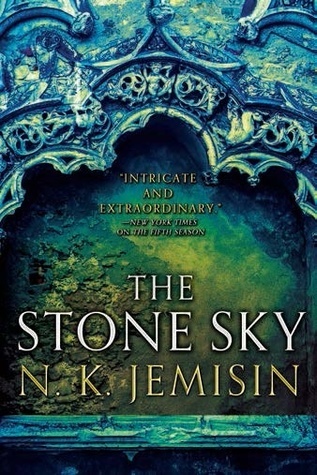 I keep wondering if Jemisin studied geology at some point."